An estimated 1.1 million people reportedly enrolled in health care coverage through the federal marketplace between Oct. 1 and Dec. 24, the government announced Sunday, according to CNN. A large number of enrollees—975,000—signed up in December, Marilyn Tavenner, administrator of the Centers for Medicare and Medicaid Services, said in a blog post. She called it "a welcome surge in enrollment" due in part to improvements in the notoriously glitch-plagued website healthcare.gov. On Dec. 23 alone, officials said, the site saw nearly 2 million page views and the call center received more than 250,000 calls. 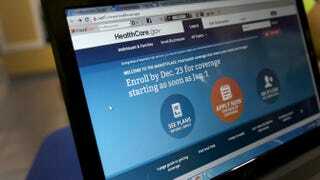 The numbers do not reflect individuals who signed up for insurance through state-run marketplaces, CNN reports. Fourteen states and the District of Columbia operate their own exchanges. But some states also reported seeing an enrollment jump. California, for example, said 77,000 people picked a plan in the final days before the deadline, the report shows. The numbers also do not include new enrollees for Medicaid. As of Nov. 30, CNN reports that more than 800,000 were found eligible for the insurance program for the poor. Additionally, individuals who missed last week's deadline for coverage that begins Jan. 1 can still sign up for coverage starting Feb. 1, CNN reports. That deadline is Jan. 15.